No matter how you look at it, the outlook for the current U.S. job market is bright. As of the most recent Bureau of Labor Statistics Employment Situation Summary, the unemployment rate had declined to 4.6 percent, and employers across the country added 178,000 jobs in November 2016.Of course, a better market for employees means that employers need to focus harder on retention. In July 2015, we took a look at job satisfaction rates — and how a company’s tuition assistance program can affect them. CareerBuilder found that more than half (52 percent) of workers “feel like they just have a job, not a career.” While younger workers ages 18 to 24 are the most likely to report this at 65 percent, more seasoned workers ages 35 to 44 (48 percent), ages 45 to 54 (57 percent) and ages 55+ (54 percent) also share this sentiment. As any HR professional knows, employees who feel like they have “just a job” are the employees most likely to leave. Fortunately, employer-provided benefits like tuition assistance and education assistance can help stem the tide of this potential turnover. Whether these programs take the form of scholarships for employees, tuition reimbursement, children-of-employee scholarships or community scholarship programs, they’re the kind of benefit that employees are looking for. Start an education assistance program with Scholarship America today. The Society for Human Resource Management’s (SHRM) 2015 Job Satisfaction and Engagement Report agrees. According to that report, “Generation X employees were more likely to report paid training as a contributor to their job satisfaction compared with Baby Boomers.” SHRM also notes that employers who require their workers “to have advanced degrees or value higher education in their culture may want to emphasize this benefit in order to attract talent.”Education benefits are vital for any organization looking to attract and retain a great workforce. But how do you ensure the ongoing impact of those programs? Our 2015 blog post goes into detail, but these are the most important points. Understand your budget. 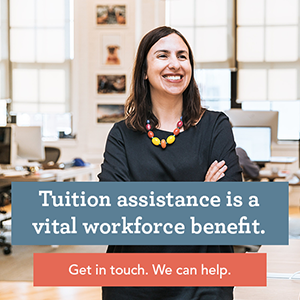 This goes hand-in-hand with setting up your program criteria, such as how many employees can qualify for tuition assistance in a year, what programs are approved for reimbursement and when (or if) to cap your organization’s contribution. Education assistance and tuition reimbursement offer a significant return on investment for companies of any size. They help make employees happier, more motivated and more capable. In addition, your company will have a bigger, smarter, more flexible pool of workers, which can attract more talent. And, by recognizing your employees’ value by supporting their education, you’ll help keep that staff engaged — and retained.